Product Description Mini blind wand tilter for square tilt rod. Product Description Mini blind tilter for brands that use a 1" x 1 1/2" headrail with a hex shaped rod inside the headrail. The headrail will measure 1.5" wide, 1" tall. It will also have an opening that looks like the letter D.
Product Description Levolor Riviera one-inch aluminum mini blind wand tilter. Tilter comes complete with hook and sleeve. Product Description Levolor Riviera one-inch aluminum mini blind wand tilter. Clip to attach to headrail internal rod included. 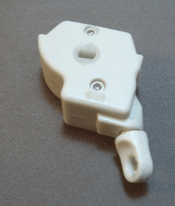 Product Description Tilter for 1" x 1" headrails used on one-inch blinds wood and aluminum. Product Description Mini blind tilter for various brands that use a 1" x 1" headrail with a small "D" shaped shaft. Does come with wire hook attached as shown. Product Description mini blind tilter for a 1" by 1" headrail and a rounded rectangular tilt rod.